The date was Friday, June 24, 1994. President Bill Clinton made a trip to St. Louis for a fundraiser and to speak in Fox Park about the Summer of Safety and the benefits of urban living. His transportation choice from Lambert Field? A gleaming MetroLink train. According to the Post-Dispatch the next day, “with the help of John Leary, the executive director of the Bi-State transit system, and in front of the news media, Clinton used a Susan B. Anthony dollar to buy a MetroLink ticket. The president appeared to be the only paying passenger among the dozens in his entourage – including the press and elected officials – who rode the train with him. Although it didn’t make any of the usual stops before Union Station, the train slowed enough so Clinton could wave at the would-be passengers standing on platforms. “The most honored seat – Clinton ‘s lap – went to 6-year-old Michael Brasher. The boy’s parents, Bill and Patricia Brasher of Richmond Heights, are friends of (Richard) Gephardt. 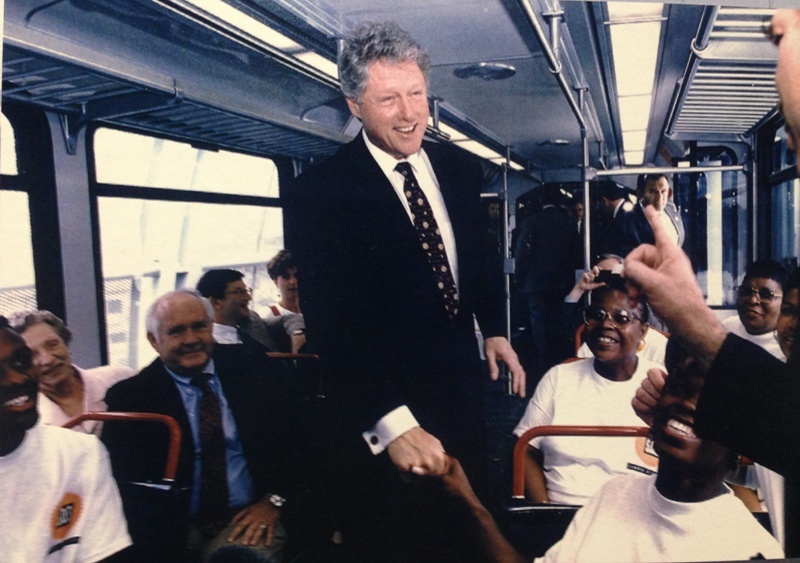 Happy Friday — and Happy 20th Anniversary to MetroLink!